I shared my process of creating art. I discussed materials, inspiration, execution of artwork, and evolution of individual style. Thanks to all that came to my presentation, Expressions in Color, despite a crazy night of winter weather advisories. It was a whirl wind night and we hope you enjoyed the talk. My painting ”Past Reflection” won the “Award of Excellence” at this years Illinois Watercolor Society's Members Show at the Mayslake Peabody Estate. 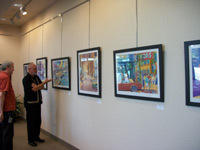 The Downers Grove Library has a wonderful gallery, I had 22 paintings on exhibit for the month of July 2012. 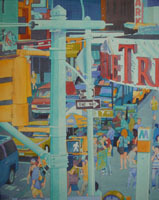 My watercolor entry “Summer in the City” won Honorable Mention at the prestigious 2012 “Best-of-the-Best” Alliance of Fine Art Show at the Mayslake Peabody Estate, it was one of eight paintings selected out of 61 outstanding works of art. 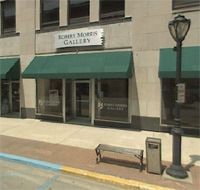 This was my opening at the Robert Morris Gallery in Springfield. We had a great turnout and a wonderful evening. Springfield has a vibrant art community and made the event very special. This is one of seven paintings installed at the new Marriott hotel in Naperville, IL. 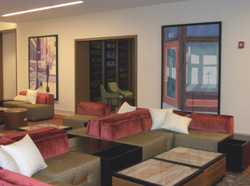 The paintings were enlarged as murals and are up to eight feet tall or wide and are installed in the main lobby and resturant. One of the criteria for this hotel project was that local artists be used. Three of the murals were chosen from existing paintings of mine, and then the client commissioned me for four additional paintings to be painted in my style based around travel themes. After submitting the final four paintings the response from the client was “LOVE. Please let the artist know that we are extremely happy with the commissioned work and thank you for all your help.” This is my first permanent major installation. 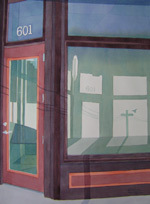 A juried exhibition of new works by members of the Elmhurst Artist Guild. Entries were judged by Tristan J.M. Hummel, program manager/curator for the Chicago Loop Alliance. 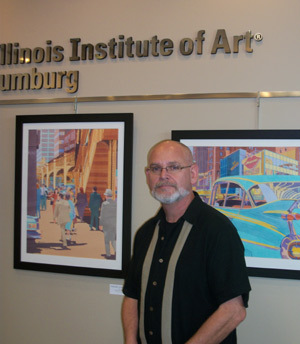 I had a solo exhibition at The Illinois Institute of Art in Schaumburg. 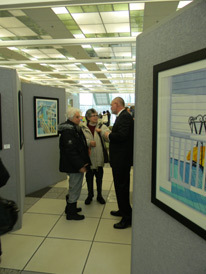 I was invited to show after the Gallery Committee Chairman saw my show at the Woodridge Public Library. 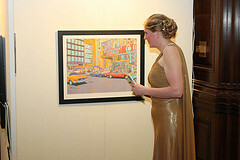 I have 14 of my urban cityscapes and figure works on display. 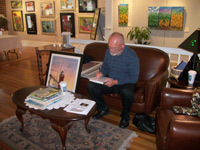 I was invited to judge the art show “Farms and Barns 7” at The Next Picture Show Gallery in Dixon, IL this last Friday. In addition to judging the art show, I was invited to hang a solo exhibition in their lower gallery. It was quite the challenge to pick only six winners out of the 94 wonderful entries. I spent the entire afternoon selecting the winners and writing up my critiques. The evening was attended by over 200 guests and I enjoyed talking to as many artists and guests as possible.It was a very special evening and I want to especially thank Bonnie Kime, executive director of the gallery, and my wife Mary Ann, whose help made everything go flawless. Thanks to my sister and brother-in-law, Joan & Steve, for introducing us to the gallery. 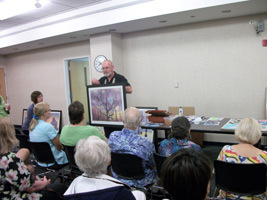 I was invited to do a watercolor demonstration and art talk with the Downers Grove Artist Guild on Monday evening. I brought along nine completed paintings and explained my different approaches and techniques with watercolors. I had two paintings in process and demonstrated two different watercolor techniques that I employ in my works. We had great interaction and lots of questions from the group. I look forward to working with the guild in the future. They were a great group! This was my first time experiencing ArtPrize as a participating artist. ArtPrize is the most incredible format, immersing artist and the public in what can only be describe as a festival of the arts. Spent a weekend exploring all the different venues and did not come close to seeing all the art. My thanks to all the people at The City Gallery, it was a great venue. I was amongst some great art and artist. I got to meet and share with artist from around the world. .
Mary Ann and I were invited as guests to the Union League Club of Chicago's black tie event, Under the Tuscan Sun. My original watercolor State and Adams was auctioned at the event and the proceeds went to support the Civic and Arts Foundation. You can see my painting from the event in this Flickr set. 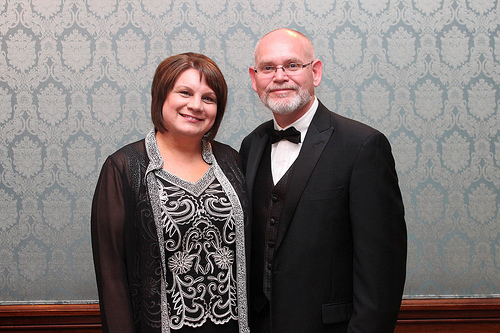 A good time was had by all, bow tie and all. A great date night. 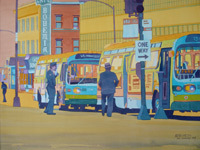 My watercolor entry of Summer in the City won “Best of Show” at the “Elmhurst Artists’ Guild - Spring Art Show” at the Elmhurst Museum. This was a juried show with over fifty strong entries. 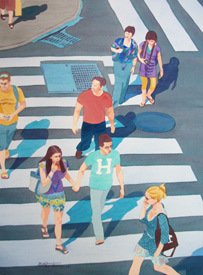 The artwork was judged by Nina Weiss, a nationally recognized landscape artist and instructor at the School of the Art Institute, Columbia College and Evanston Art Center. This affirmation helps as I continue to push into new directions with my art. With over ninety in attendance last night the EAG is a wonderfully supportive artist community to belong to. April 3 – May 13, 2011. 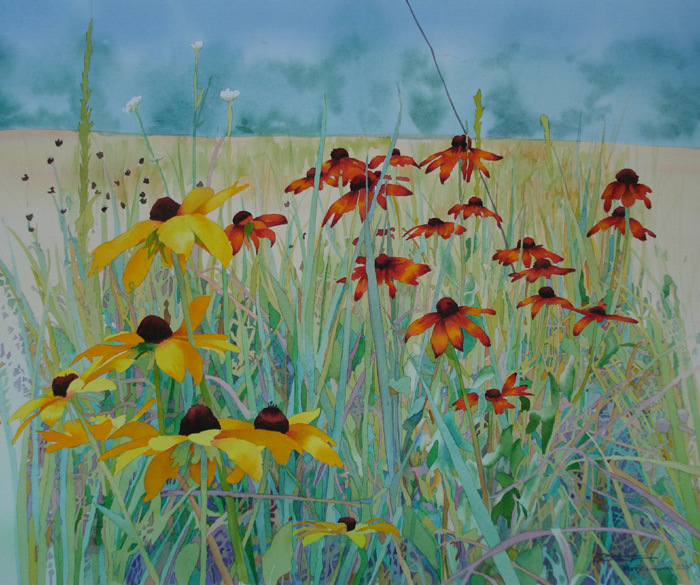 I donated a Limit Edition Print of Wildflowers that was auctioned to support the Willowbrook Wildlife Haven. 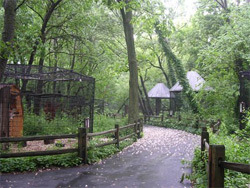 The WWH promotes harmonious coexistence between the people and wildlife of DuPage County. Last year, they admitted a record of 8,343 injured, ill and orphaned wildlife animals for treatment and presented hundreds of educational programs. It is wonderful that my artwork can help support our local community. During the month of February, the Woodridge Public Library featured my watercolors. 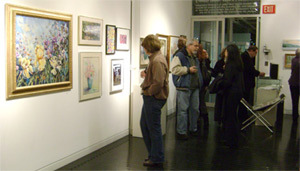 The show included thirty-one of my original watercolors and many limited edition prints. This was my largest show to date with thirty-six paintings on exhibit. The State Street Gallery is on the corner of State and Van Buren in downtown Chicago. I had the opportunity to install my exhibition at the State Street Gallery at Robert Morris University (Chicago). Working with the curator and staff was great. They let me be involved in all aspects of installation: laying out the artwork, hanging the pieces, arranging the partitions, and even letting me climb the stepladder to do the lighting. When unpacking the artwork, we had found two paintings with broken glass. Luckily, I had packed two spare frames. It ended up taking seven hours to get everything just right. 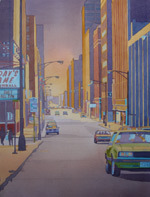 It was quite a rush to stand outside on downtown State Street in Chicago and see my artwork through the windows! 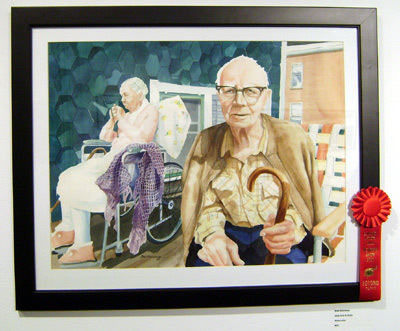 This was my first showing at the EAG Winter Show, and I brought home a second place winning in the juried show. Amongst fifty-five strong entries, I was pleasantly surprised to place with an older piece. I’m looking forward to exhibiting my newer pieces in the future. My newer works show my personal style developing and are much stronger pieces. I joined the Elmhurst Artist Guild. The EAG has a world class facility; The Elmhurst Museum, and a great variety of activities each year. 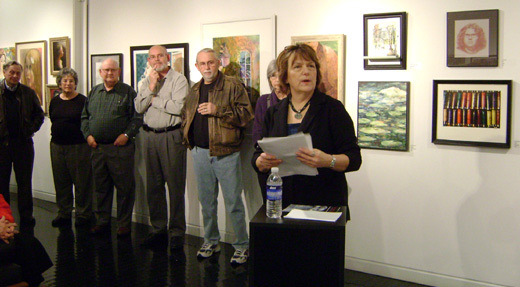 My first activity upon joining was participating in their Winter Art Show. 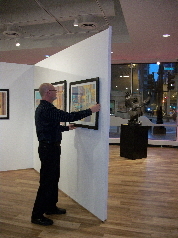 The majority of my paintings were at the State Street Gallery in preparation for my solo show. I borrowed my painting Busia and Dziadzia from my in-laws to display at the Winter Art Show. I was honored to be a guest artist attendee at the CAF's seventh annual luncheon in honor of Chicago Artists Month. 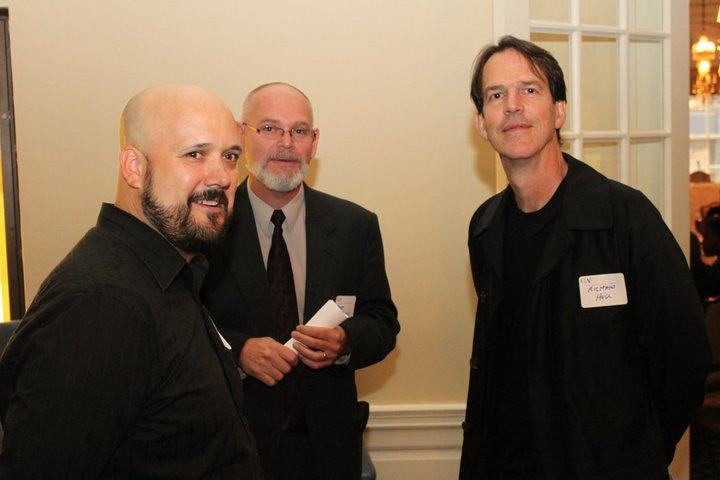 Two hundred artists joined together for the luncheon and panel discussion, which was moderated by James Yood. The topic was Art and Money: The Business of Art.The panelists were Russell Bowman, Russell Bowman Art Advisory, former Director of the Milwaukee Art Museum, Monique Meloche, Owner of moniquemeloche Gallery, and Gary Metzner, Sotheby's Fine Art Director for the Midwest. I was the Art Department’s keynote speaker at Hinsdale Central High School. I gave two 2-hour presentations, one in the morning and one in the afternoon. I enjoyed sharing my love of watercolors and being able to encourage young artists. 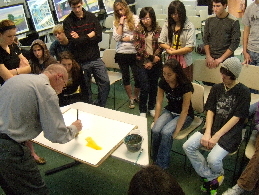 The presentations included watercolor demonstrations. A New Day was the painting I started at the demo.